Being a more abstract-like picture, the light source is less important to note than in my other Bible Cartoons, which are more realistic in nature. Nevertheless, the light illuminating the eagle is coming from the left, casting shadows to the right. 01) (Previous page) Isaiah 40 – Fiery Eagle (Version 01 – Crystallized backgnd with text). In this version the eagle has my usual, characteristic black keyline (outline) around it. Notice the background has had an effect added to it, which crystallizes the colours, unlike version 03 & 04, where the colours have a smooth, flowing nature. This version also has the Isaiah 40:31 text on the right hand side of the picture. In this version I have removed my usual, characteristic black keyline (outline) from the eagle. 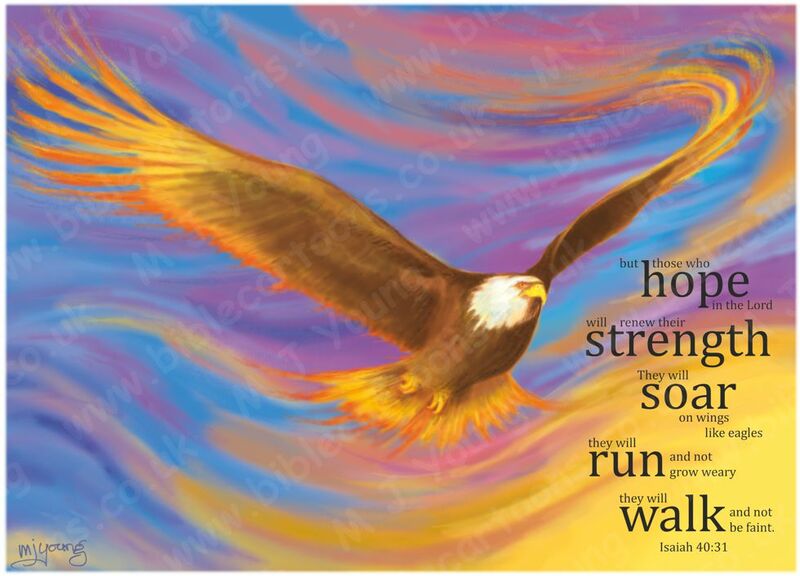 This second version of the fiery eagle has the same crystallized background as the first version, but I have removed the Isaiah 40:31 text from the picture. This version has smooth background colours – the crystallization effect has been removed. This version has the Isaiah 40:31 text on the right. I have removed the Isaiah 40:31 text from this picture. I created this scene for my wife. It only took a few hours to complete version 01, which is pretty fast for me! She decided she would like the eagle to look browner; more like the bald eagle in real life, which the eagle is based on. So version 03 & 04 were created with that in mind. I normally have a black keyline (outline) around the figures and objects in my scenes. Only the first version of the 4 scenes has that characteristic outline feature. And, in fact, I only added it after I’d finished the picture, whereas I normally draw the keyline first, scan it in on my computer and then colour up a scene. 31 But those who wait upon God get fresh strength. They spread their wings and soar like eagles, They run and don’t get tired, they walk and don’t lag behind. 31 but  they who wait for the Lord shall renew their strength; they shall mount up with wings  like eagles; they shall run and not be weary; they shall walk and not faint.